Rivendell 4 ~ The Red Book: “This is wonderful!”, plus Pt. 2 of jan-u-wine’s “Rivendell Suite”. 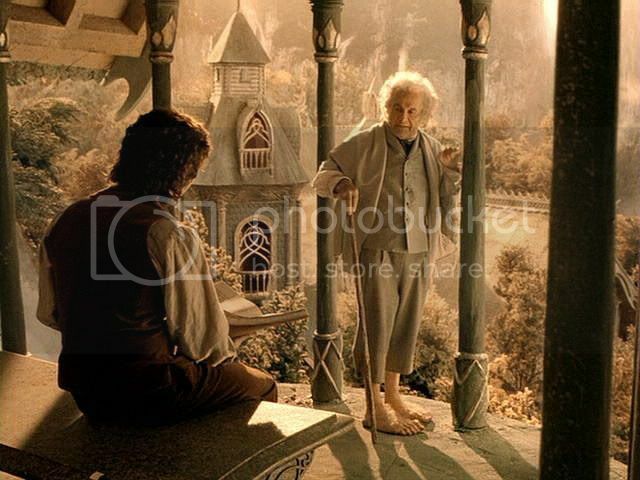 A significant difference, to me, between the book and film versions of the Rivendell sequence, is the way Bilbo is portrayed. He is far more frail in the films. In the book, Bilbo still feels fit enough to volunteer to take the Ring to Mt. Doom. (He does it, incidentally—as will be seen in the book texts for the Council of Elrond series—in order to spare Frodo, not to get his hands on the Ring.) Even after he has become doddery when the Fellowship returns, Bilbo is strong enough to make the journey from the Misty Mountains to the Grey Havens on horseback. Even more striking to me than his great physical stamina, is Bilbo’s inner stamina. In the book, even though their relationship involves a lot of mutual kidding, the Elves of Rivendell obviously regard Bilbo not only with love but respect. He is dear to them, but also seen as someone of worth and character. 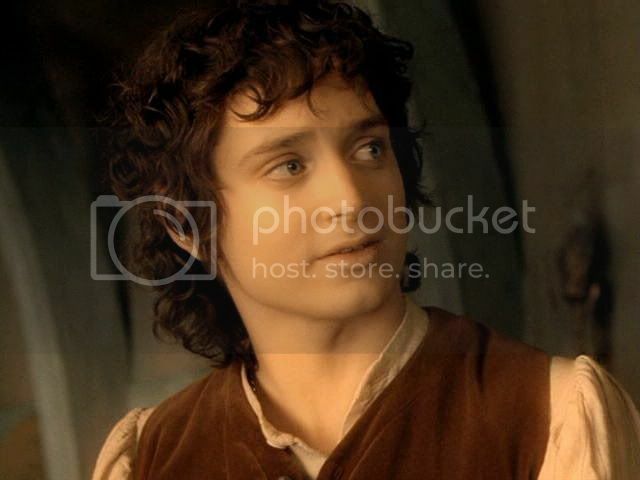 Bilbo's essential honesty and decency have always shone, attributes that few Men and not every Elf (judging from their spotty history in Middle-earth) can match. 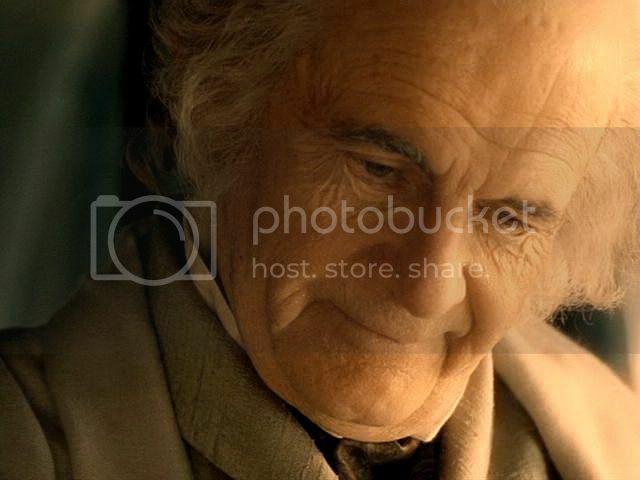 To the Elves he is not “Mad Baggins” sitting on his riches in Bag End, nor even beloved “Uncle Bilbo”, he is their peer: a person of wit and great heart, the doer of resourceful and brave deeds, especially at the Lonely Mountain and the Battle of the Five Armies. He is a scholar, poet and humourist, yes, but also an honoured veteran, and taken seriously as such. I am sure it was an eye-opener to the hobbits, even to Frodo, to see how Bilbo was regarded by the high folk of Imladris. The film scene, while different, has its own beauty. 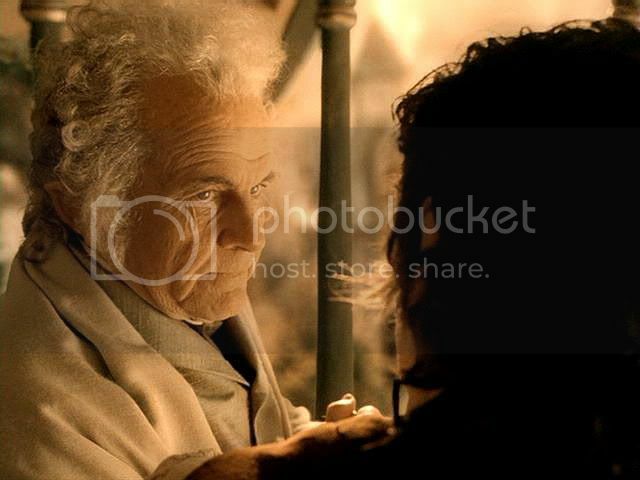 Bilbo’s greater frailty accentuates Frodo’s corresponding sweet, protective side. 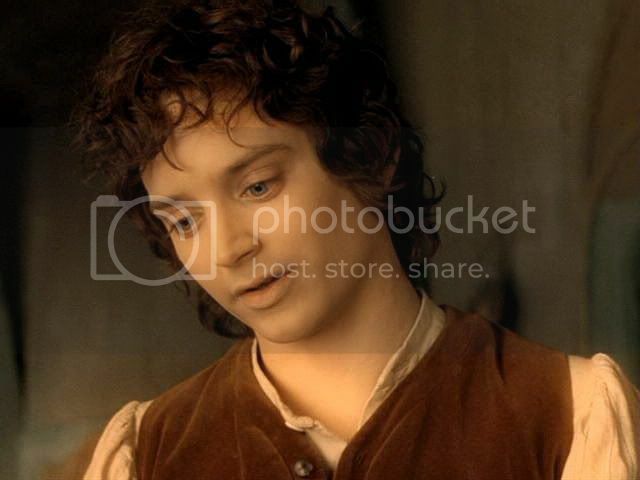 Bilbo is the one that needs caring for now, and Frodo must gird himself to be the strong one. 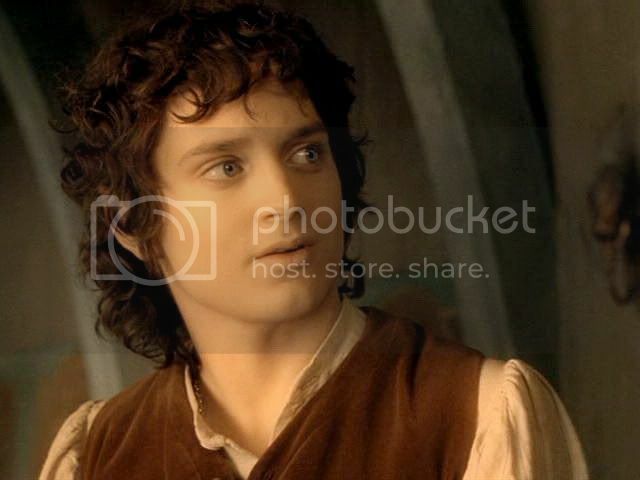 Part two of jan-u-wine's Rivendell Suite, written specifically for this series of entries featuring Bilbo and Frodo, continues in this post. Again, Jan-u-wine weaves her word-magic. 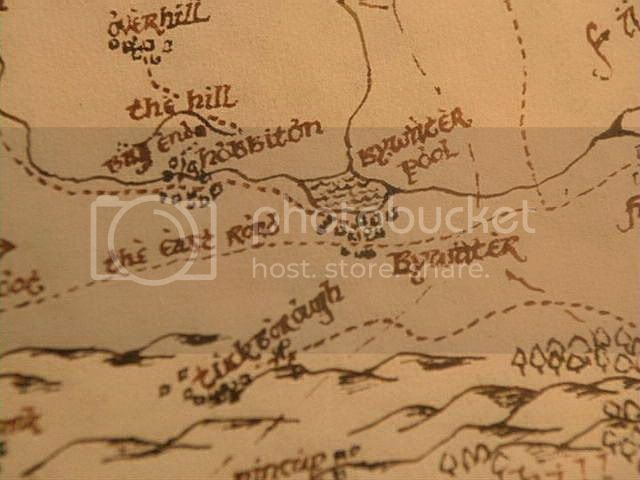 One may stand at the Ring-bearer's shoulder as he turns the pages of the Red Book, even tip-toe inside his thoughts as he remembers waking up in this strange place, sees the map of the Shire before him, and begins to hear the call of Home. 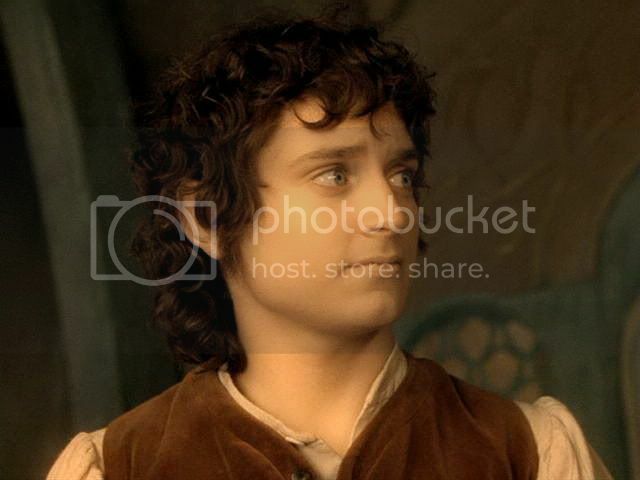 In the meanwhile Frodo and Bilbo sat side by side, and Sam came quickly and placed himself near them. They talked together in soft voices, oblivious to the mirth and music in the hall about them. Bilbo had not much to say of himself. When he had left Hobbiton he had wandered off aimlessly, along the Road or in the country on either side; but somehow he had steered all the time towards Rivendell. 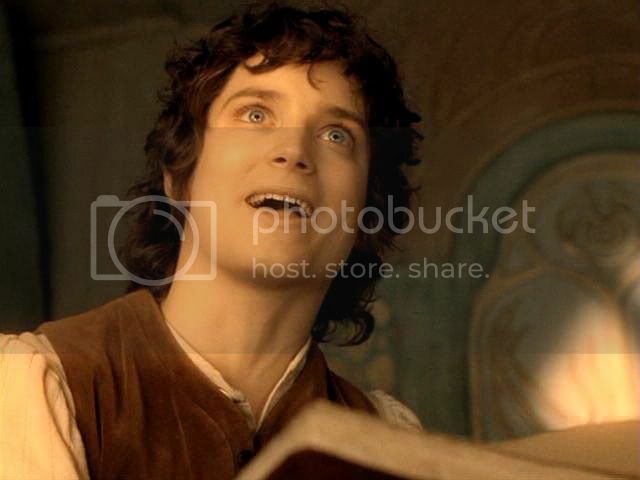 At this point in the book comes the scene in which Bilbo asks to see the Ring, and is transformed in Frodo’s eyes. After the shadow passes, the two catch up on Shire news. Aragorn returns, and he and Bilbo go off together to work on Bilbo’s song. Sam has fallen asleep. 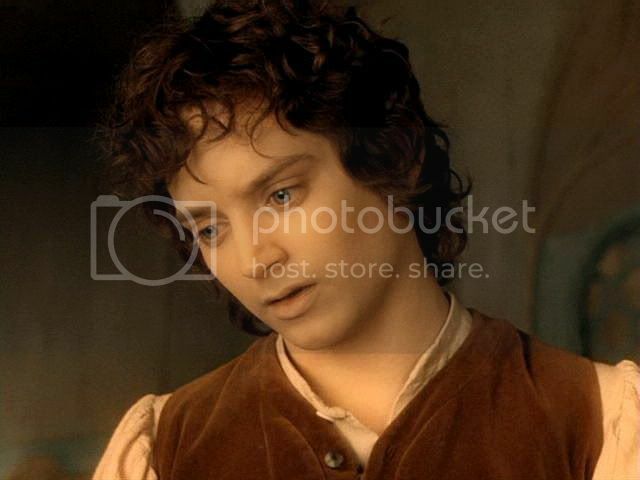 Frodo, feeling a little forlorn, gives himself over to the magic of the Hall of Fire. The music of the voices and instruments transport him, turning into running water, a river of gold and silver flowing over him, drowning him, sinking him into sleep or a dream of music. The music turns into running water again, which turns into a voice. 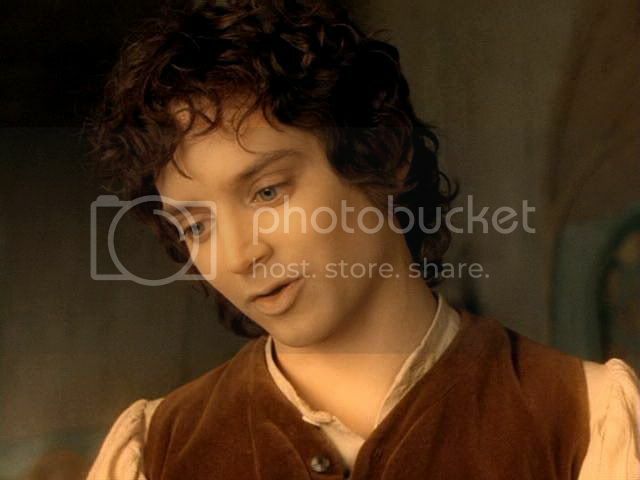 Frodo, his eyes still closed, begins to listen to the song of Eärendil, Bilbo’s new composition. When it is over, Lindir, an Elf, asks for an encore, but Bilbo says it would be too tiring to repeat it. The hobbit and elf trade laughing barbs. Can’t Lindir tell which parts were Aragorn’s and which Bilbo’s? Lindir says he can’t tell the work of Mortals apart. ‘I am not going to try and guess,’ said Frodo smiling. 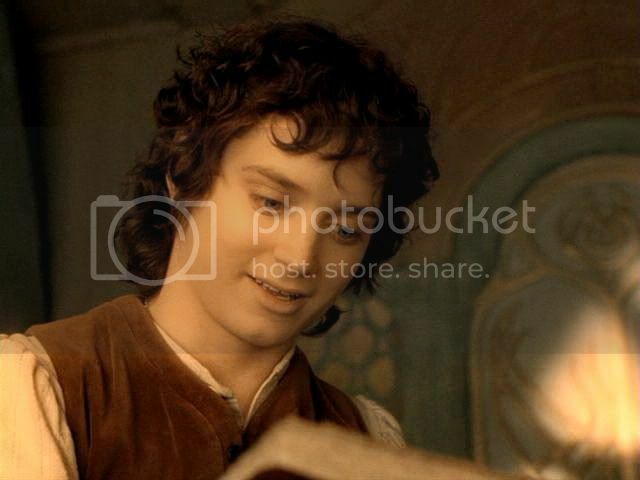 Sitting on a bench in a covered porch or gallery, Frodo looks at Bilbo’s book. He reads the title page, then begins to flip through it. Bilbo, holding onto a column for support, is standing at the porch’s edge in the sun. 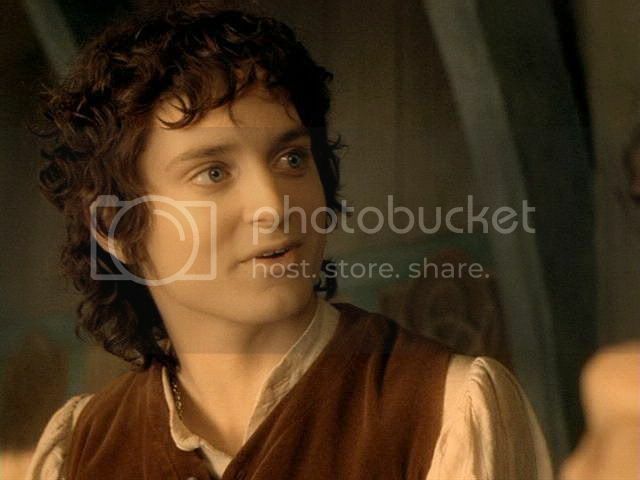 Frodo: “There and back again, A Hobbit's tale, by Bilbo Baggins.” This is wonderful! Bilbo: (Turning to Frodo) I meant to go back. Wander the paths of Mirkwood, visit Lake-town, see the Lonely Mountain again. But age, it seems, has finally caught up with me. Frodo watches as Bilbo carefully makes his way to the bench to join him. 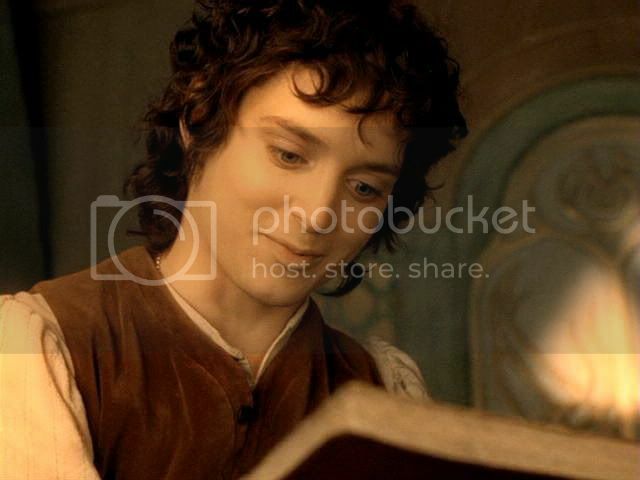 With Bilbo at his side, Frodo returns his attention to the book. 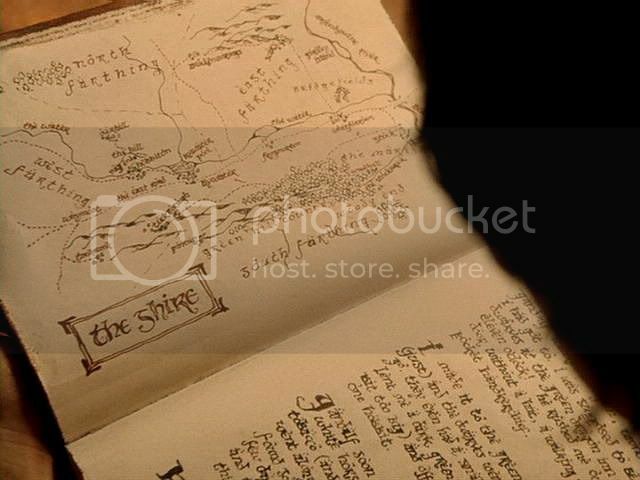 Bilbo watches Frodo's response as he looks at the map of the Shire. Then they look at the map together, which the camera shows in close-up. within the study's rounded hearth. ~ Riv. 3 – Reunion with Bilbo, plus Pt. 1 of jan-u-wine’s ‘Rivendell Suite'. ~ Riv. 5 – The Red Book: ‘I’m not like you, Bilbo’, plus Pt. 3 of jan-u-wine’s ‘Rivendell Suite’. 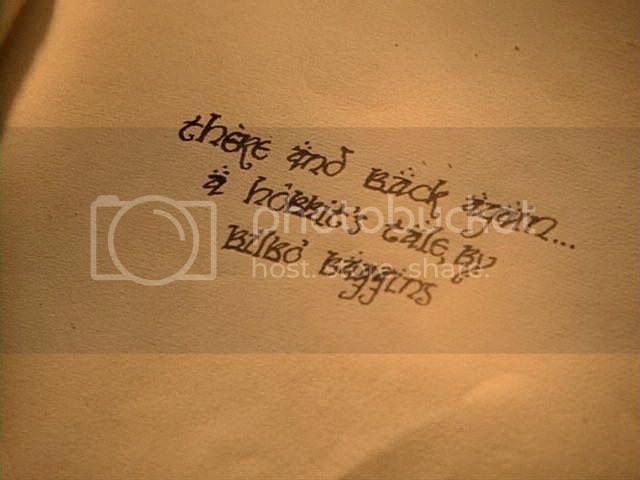 To them he is not “Mad Baggins” sitting on his riches in Bag End, nor even beloved “Uncle Bilbo”. He is their peer, a person of wit and heart, the doer of resourceful and brave deeds, especially at the Lonely Mountain and the Battle of the Five Armies. He is a scholar, poet and humourist, but also an honoured veteran, and taken seriously as such. I am sure it was an eye-opener to the hobbits, even to Frodo, to see how Bilbo was regarded by the high folk of Imladris. How wonderful. Bilbo gave up the Arkenstone, his wealth, and then the Ring, and fully deserved to live out his 'second act' in Rivendell, and his 'third act' in the West, amongst his beloved Elves. Ohhh, that poem! I love the idea of the Red Book being full of "home" and "wonder". Ah, Bilbo and the Arkenstone. What he screwed up his courage to do, and the wisdom he showed in doing it (vis-a-vis Thorin and trying to end the strife between the allies), at the cost of tremendous internal struggle, was to my mind the greatest thing Bilbo did, a great deed to rival the great deeds of others, even if it wasn't an act of physical combat. P.S. I love your notion of Bilbo's "three acts", Shirebound. P.P.S. Reading your citation from my post, I realised I had left out something important in my editing, so I put it back in, the note about Bilbo's "essential honesty and decency". Just so you won't do a "what the..?" if you go back and look at it. This post had me in tears. Lovely, Mechtild... really lovely!! It's a beautiful poem; especially set off with the movie scene and its images, it makes me weepy too. Lovely post, Mechtild. You continue to weave movie images, Jan's poam, excerpts from the novel and your own analysis into a compelling and emotional whole that is always rewarding to appreciate - slowly and carefully, if possible. Thank you. The way Frodo looks in this scene, right down to how his slight elvishness is subtly hinted at by means of the background's Rivendell colours of brown and muted turquoise taking up the colours of Frodo's clothes and eyes, has always drawn a strong response from me. He looks almost otherworldly, and the sadness and memories of pain that lingers on his features... *sigh*. Of course there are so many, but I would maintain that this is one of the most exquisite Frodo sscenes of the film trilogy. Pardon the spelling mistakes. I guess it's still legible, or I would delete and re-write. The first time I saw this scene I was INTENSELY annoyed with the script-writers for making Bilbo so frail that he didn't make it back to see Dale or the Lonely Mountain again. I sat there in the Odeon SEETHING. 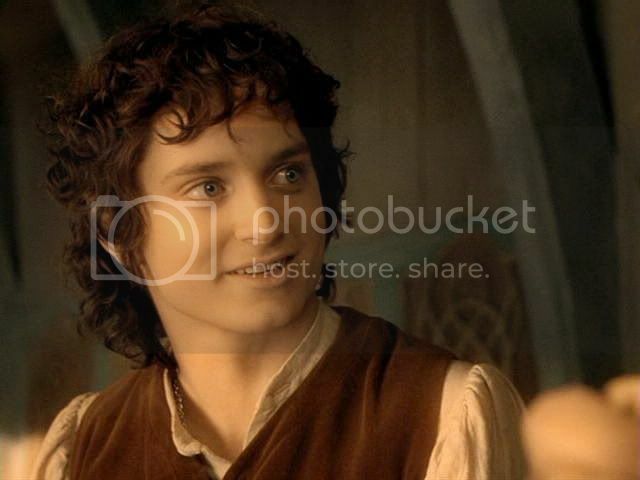 However, Holm's exquisite acting, and Wood's dreamy, affectionate young Frodo, and the sheer loving sensitivity with which this surrogate father/son relationship was portrayed on screen, won me over completely. Frolijah is exceptionally lovely in this scene. As is everything else: the soft, autumnal, amber light of Film Rivendell is perfection. Jan's poem is lovely, of course. Howdy, Pearl! 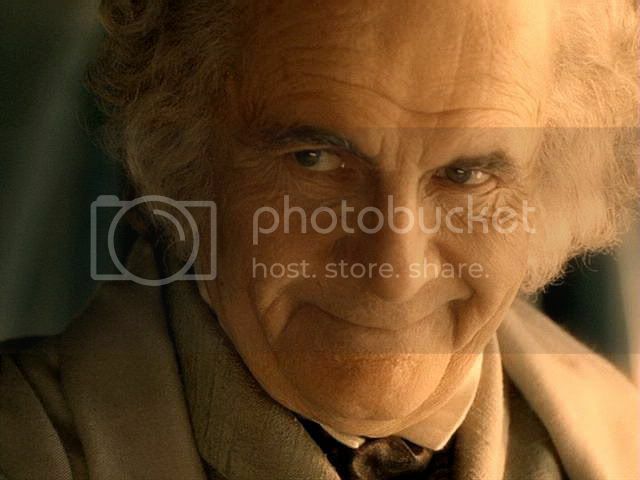 Your response was close to mine: I missed the book story in this scene, although I wasn't as incensed over the undercutting of Bilbo's worth, but for the very reason you speak of: Ian Holm's acting in this scene was so incredibly lovely, sensitive and endearing, I just couldn't complain. It brought out a beautiful (i.e. 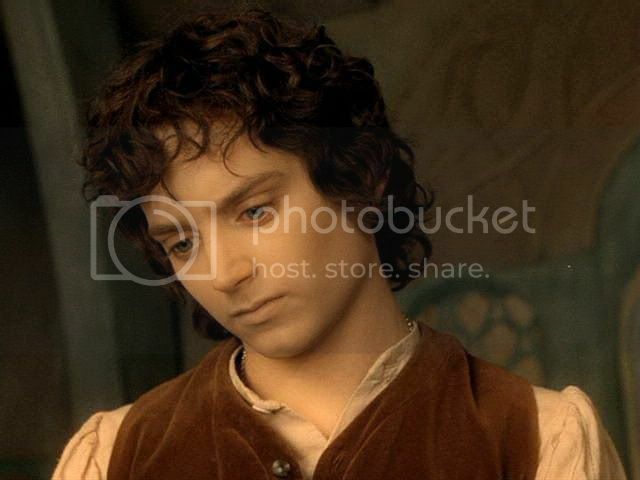 contemplative, not weak) softness in EW's Frodo, too. Gorgeous screencaps, Mechtild. Frodo's face still bears evidence of his recent illness, with his wan complexion and those pale lips ~ but oh, he is sublimely beautiful here. 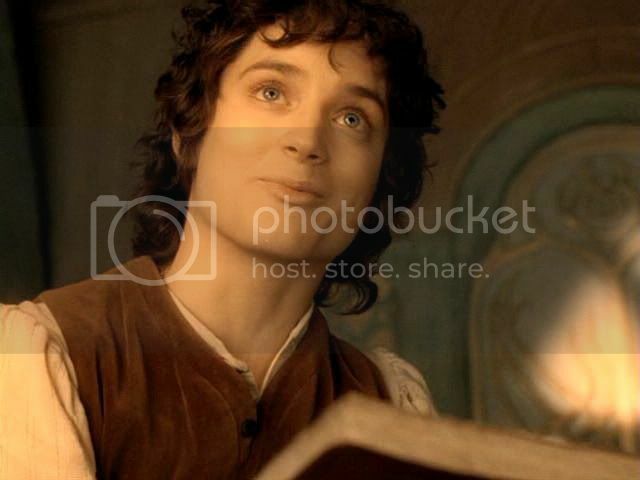 I wish we had seen more of Frodo and Bilbo together in the films, but I do love this little scene. I'm sure I recall Elijah commenting somewhere that he was in awe of Ian Holm and nervous at the prospect of working with him. For me, their few scenes together are like rare gifts to treasure ~ even those that deviate from canon. Lovely, just lovely. 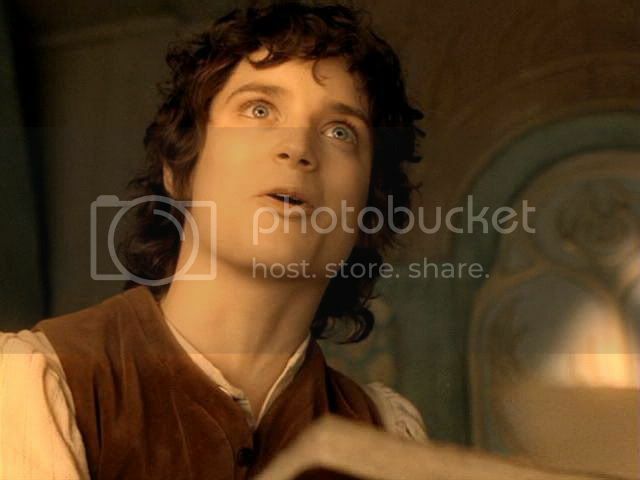 Me too, my dear Frodo. Me too. I would love to hear more from Ian Holm about his work experience on the films. The most I've read was in Ian McKellen's blog, which I quoted in the third part of the Ian McKellen series. He didn't share any stories or reflections in the DVD extras or commentaries, but I wish he had. All of Blossom's slideshows and animations are wonderful, but the ones for this scene are extremely moving, probably because the film scene itself is so good. I agree, it's a beautiful sequence. I wish there was more in Rivendell, but I am always saying "I wish there was more" something. I told Pearl at some point I wish they'd do a super long miniseries of LotR in England. Then they'd have time for everything. Thank you for distilling all of those expressions from the scene. I just saw it again on the big screen, and I'm grateful for the light and coloring you've brought to the captures giving them so much more clarity. 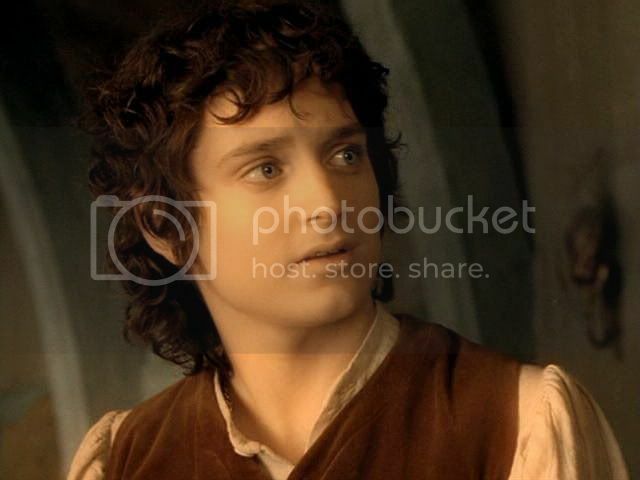 Jan's poem really captures Frodo's bittersweet hunger for home. She delicately lets the reader bring their own sadness for Frodo's loss of that life-giving hunger that they know the quest will exact. I love the phrase "autumn-honey'd light." YOU SAW IT AGAIN ON THE BIG SCREEN?????? Oh, lucky you! I'd love to see it at the movies again. I saw it on a fairly big screen last winter (at an old neighbourhood movie house in Minneapolis that plays old films), but the LotR fan crowd watching it was rather silly and sometimes incredibly noisy. I'd never been to a screening "for fans", and that will be my last. How I longed for the times I saw the films at regular theatres, with involved, attentive audiences. How was your screening? Gee, FSS, I thought you didn't read these posts, just looked at the pictures. I'm glad you found it interesting, truly. I know you have very, very little time for LJ. Yes, you ought to be able to make a new crop of icons when you are feeling contemplative or out of sorts. That's where I get mine from, from these screencaps. I love it when people can use them for their own projects.